GPS technology is becoming increasingly attainable by the average consumer. Decreasing prices have resulted in an increase in the number of portable GPS units on the road today. I recently picked up the entry level Garmin Nuvi 200W and find myself becoming increasingly dependent of the technology. Roughly one out of 10 vehicles I see on the road today has a GPS device stuck to their front windshield, and I’m not even making an effort to look. While I have thoroughly enjoyed the experience of GPS aided driving thus far, I have been a little disappointed by the fact that I am not able to download travel information & data – ideal for long road trips [from devices like the Garmin]. 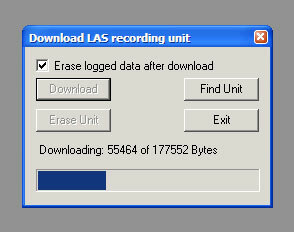 Fortunately, Rob from LandAirSea got in touch and provided the LAS Tracking Key. The overall appearance of the device is minimalistic; an unmarked oversized USB thumbdrive with the words "This side up" etched on one side. The strong magnet on the opposite immediately adds to the mystery of the device. What is it? What does it do? What can I use it for? And, how well does it work? Powered by the U-Blox RCB-4H Antaris 4 GPS board, AirLandSea’s Tracking Key is a low power consumption GPS receiver with SuperSense – ideal for scenarios with low satellite signal. Building interiors, airports, shopping malls, train stations and other places with obstructed views to the sky are a key challenge for uninterrupted GPS signal reception and for accurate position calculations. Under these challenging conditions, the GPS receiver must be able to detect the weakest signals perceivable in places with no direct views to satellites. Unlike your standard automobile / portable GPS device, the LandAirSea Tracking Key is not interactive – meaning that the device is just a receiver. On its own, it will not direct you through an alternative route – like a TomTom – and will not guide you when you are lost – like a Garmin. The Tracking Key is a GPS based tracking device. Although the Tracking Key may not have a screen or buttons to press, its basic design does do one thing well – tracking. Using GPS / A-GPS (Assisted GPS) technology, ALS’s Tracking Key can pinpoint and amass a significant amount of data for later processing using applications like Google Earth. With obvious applications for use in both the Military and Law Enforcement sectors, the Tracking Key may raise privacy concerns in the eyes of the average consumer. However, the Tracking Key has real world usefulness. Consider parents with children unfettered by repeated requests to return home before curfew (where are they really going? ), managers who need accurate travel and mileage details for company vehicles, road trip warriors, or worrisome automobile owners who suspect their vehicle is being abused by a spouse, child, relative, or valet driver? Logs data, including speed, which can then be plotted out on virtual maps with software like Google Earth. Runs on 2 AAA batteries for up to 2 weeks of tracking (varies based on number of hours driven per day). Daily reports including overall driving activity, maximum speed, and miles driven. Fantastic device for use on long road trips or group outings. 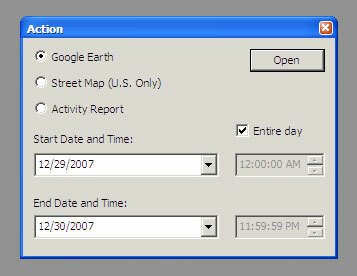 With rich Google Maps in Google Earth, you can use stored data to tag important locations or stops. Great for tracking where your child actually goes vs. where they said they were going. Security and peace of mind knowing where your vehicle has been driven, how fast, and for how long with stop " go milestones. The GPS Tracking Key is roughly the size of a big pack of Juicy Fruit gum. Shrouded in a veil of mystery, the plain black casing is marred only by engraved letters reading "This side up" and a strong magnet. After a brief perusal of the thin user guide, you immediately understand what the device was made for – discrete GPS tracking. Because of its small size, discrete color, and rear facing magnet, the device can be stowed away in any number of locations ranging from the underside of a vehicle, within the front / rear bumper, rear trunk, front glove box, or underneath a driver / passenger seat. 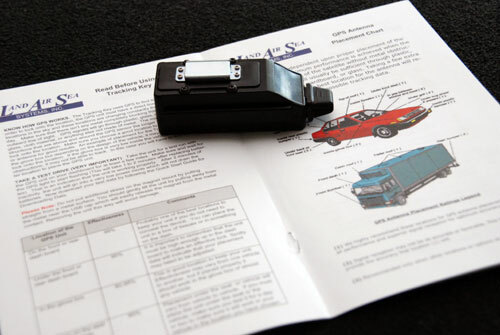 The included LandAirSea Tracing Key documentation explains the effectiveness of the device based on placement outside or within the vehicle. Both the battery compartment – secured with four screws – and USB port receive protection from water & dirt with silicone seals. Two small LEDs inform the user of sufficient battery power & satellite activity. 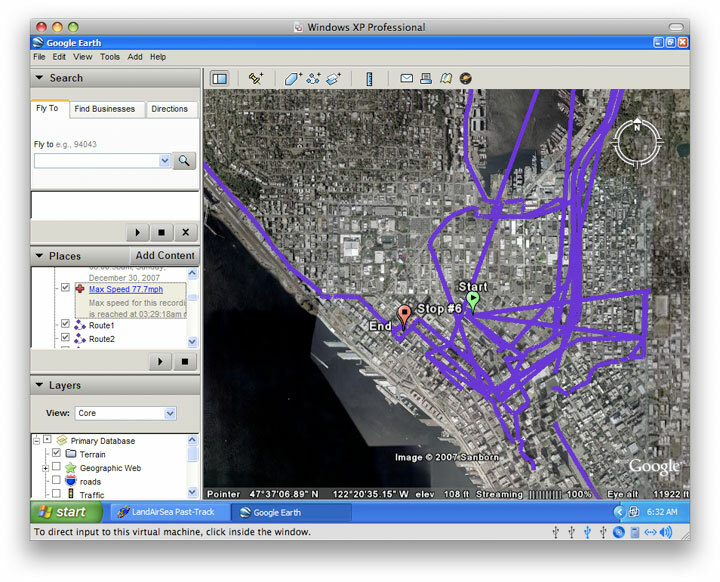 The Tracking Key includes Windows-only software called Past Track which allows users to manage and interact with data collected by their GPS vehicle tracking receiver. 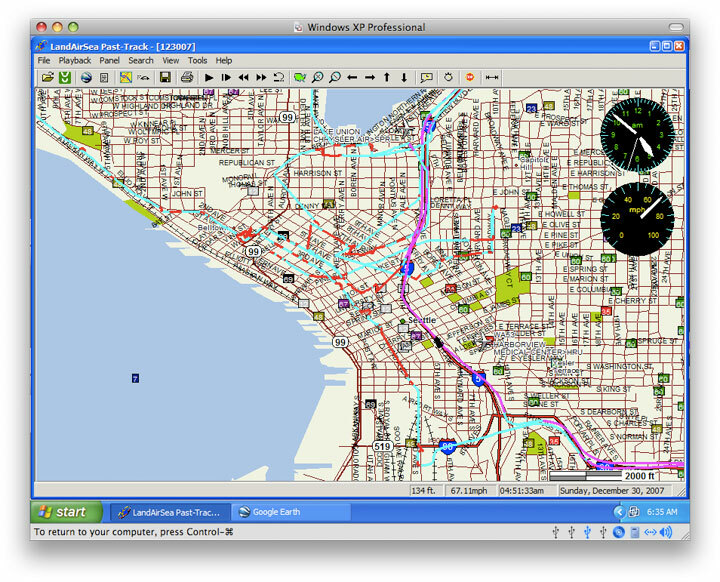 Both methods overlay vehicle activity atop your choice of mapping software. With the added benefit of creating interactive maps – placemarks & image overlays – with Google Earth, owners can re-create detailed maps using logged data. The LandAirSea Tracking Key works extremely well as a GPS tracking device. Once placed within the vehicle, the Tracking Key was completely transparent tracking my vehicles every move. It was almost jaw dropping to see a 2 days of driving history quickly plotted out in Google Earth. Discrete and effective. Once placed inside the vehicle, you forget it is present and tracking. Great at creating detailed stop & go travel history. Laptop users will need to a) purchase a USB extension cable, or b) slide part of their computer off the edge of the table a little bit in order to plug the device in. Great battery life using 2 AAA batteries. Would a little better if the device was rechargeable via USB. Mac OS support is not yet available. Privacy advocates should know that data logged by the LandAirSea Tracking Key is not transmitted externally and is available for your own personal use. The $299 LandAirSea automobile Tracking Key can be ordered direct from the manufacturer. What are your thoughts on personal GPS tracking devices for security, peace of mind, or leisure? [Digg this]. Thanks to Alan on the tip concerning the YouTube clip above exemplifying the usefulness of the LandAirSea GPS Tracking Key.